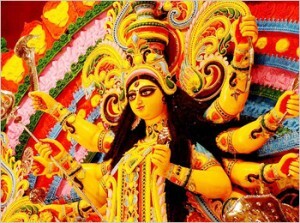 Mahanavami is third and final day of Durga Puja. Durga Puja on Maha Navami begins with Mahasnan and Shodashopachar Puja. On Maha Navami Goddess Durga is worshipped as Mahisasuramardini which means the Annihilator of the Buffalo Demon. It is believed that on Maha Navami day Durga killed the demon Mahishasura. It is important to note that depending on starting time of Navami Tithi on previous day Maha Navami Puja and Upavas might be done on Ashtami Tithi. The precise rule is that if Ashtami and Navami merge before Sanyakal on Ashtami Tithi then Ashtami Puja and Navami Puja including Sandhi Puja are done on the same day. However Durga Balidan is always done on Uday Vyapini Navami Tithi. According to Nirnaysindhu the most appropriate time to perform Balidan on Navami is Aparahna Kaal. Navami Homa is performed on Maha Navami and it is the significant ritual during Durga Puja. The best time to perform Homa is at the end of Navami Puja.